Contrary to what Orange is the New Black may lead you to believe, growing old in prison doesn't mean being left alone to putter away in a greenhouse. The United States has been incarcerating more and more people for longer periods of time since the 1970s. So it should come as no surprise that some of those people whom we’ve locked up have gotten old by now. In fact, this reality is so glaring that it’s even made it into the second season of “Orange is the New Black,” which features some of the women who have grown old behind prison walls. In the hit TV show, the character known as Jimmy obviously suffers from dementia. She wanders the wards in search of her missing husband, and even manages to walk out of the understaffed prison. When she is recaptured, she mistakes the prison auditorium stage for a diving board and jumps — but instead of landing in a swimming pool, she breaks her arm on the auditorium floor. The cost and hassle of keeping Jimmy in prison is too much for prison officials, who grant her compassionate release and drop her at the bus station. The narrative might make for dramatic television, but when stacked up to reality, the producers got the story wrong. 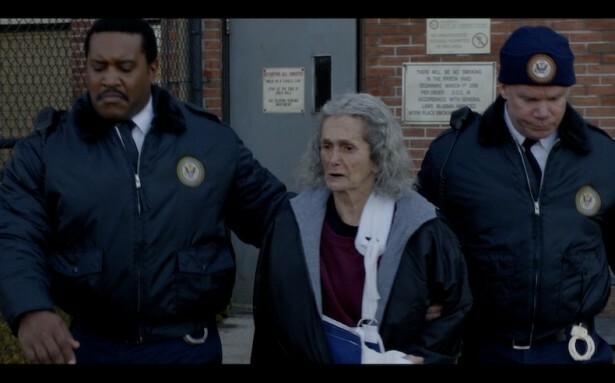 Contrary to what “Orange is the New Black” would have you think, compassionate release is not simply the act of taking an aging, senile person and dumping her onto the street. As a prison policy, compassionate release allows for the early release of incarcerated people who are aging or terminally ill so that they can die at home surrounded by loved ones. That’s the idea behind it, at any rate. But in reality, many aging people, as well as those who are terminally or chronically ill, are denied any sort of release. In its quest for vengeance, the legal system would rather continue to keep them incarcerated, even if it means footing the bill for increasing medical costs. Case in point: Patricia Wright in California. Patricia Wright is 63 years old. She is also legally blind, wheelchair-bound and suffering from stage-four cancer, which has spread to her breasts and to her brain. She had seven surgeries in 2011 alone. After each surgery, she has been handcuffed, shackled and returned to prison. Obviously, real life is not a television show. Patricia Wright is incarcerated for her third convicted felony. (Her two prior felonies are from nearly 20 years ago when her seven-year-old son stole two 99-cent toys and a hand towel from an open house.) California has a three strikes law, which mandates that people who are convicted of a third felony be sentenced to life in prison without the possibility of parole. When California codified compassionate release in 1997, it deliberately excluded people such as Wright, who are imprisoned for life without the possibility of parole. In 2010, when the state enacted medical parole to reduce the cost of expensive health care (including the exorbitant cost of around-the-clock armed guards), the policy shift again excluded people serving life without the possibility of parole. Thus, Wright’s only chance to spend her remaining days out of prison and with her family is if California Gov. Jerry Brown grants her executive clemency or compassionate release. Her children — now grown — are ready to welcome her home, but Brown has taken no action so far. Wright is far from the only so-called Golden Girl aging in California’s prison system. In an essay about prison conditions written for the zine Tenacious: Art and Writings by Women in Prison, Jane Dorotik, an incarcerated advocate for prison justice, narrated the story of her friend Helen who had been given a life sentence. At age 85, Helen appeared before the parole board. The following year, at age 86, Helen died in prison. Dorotik, now 67, is currently incarcerated at the California Institution for Women. She has identified 18 women between the ages of 55 and 75 who are years past their minimum eligible parole date, which is the earliest date at which they could be considered for parole. Some are over 20 years past the date. All have medical issues that require constant care and most are serving sentences for a single action committed many years ago. The yearly cost to incarcerate each of these Golden Girls is $138,000, Dorotik points out. Thus, continuing to incarcerate these 18 women, none of whom have had disciplinary issues in the prison within the past 10 years, has already cost the state $32.4 million dollars. One woman, now aged 75, has seen the parole board 10 times during her nearly 30 years in prison. Each time, the parole board found her “not suitable” for release. When she appealed the latest parole denial, she was given forms to fill out. With her rheumatoid arthritis, however, filling out forms is nearly impossibly painful. In the meantime, with limited mobility, the 75-year-old woman must still navigate an overcrowded prison. “I’ll hobble down the middle of the hall, hoping no one hits me or my walker by opening their door as I pass by,” she wrote in a recent letter. In addition to these 18 women, the California Institute for Women houses over 100 other women who are 55 or older. California is not the only state to grapple with an aging prison population. Today, the United States imprisons approximately 125,000 people age 55 and older — which is four times more than it did in 1995. Human rights groups, including the ACLU, Human Rights Watch and the Vera Institute of Justice have issued warnings about the increased numbers of aging, elderly and incapacitated behind bars. Several states, such as Kansas, Mississippi and Tennessee, are attempting to address the issue by building geriatric units within existing prisons. Dorotik is pushing for aging people to spend their last years out of prison. She’s proposing an elderly Alternative Custody Program, which would allow people 55 or older to be released under supervision. The state already has an Alternative Custody Program for women who are pregnant or primary caregivers. Under the Alternative Custody Program, people remain under the custody of the California Department of Corrections and Rehabilitation and can be returned to prison at any time. But they are able to live and work outside of prison, albeit with restrictions and surveillance, including ankle monitoring. While Dorotik has found some outside support among advocacy organizations and individuals for her proposal, she has yet to find a legislator willing to sponsor such a bill. Contrary to what “Orange is the New Black” may lead you to believe, growing old in prison doesn’t mean being left alone to putter away in a greenhouse or wander the prison unrestricted. Instead, it involves fighting for health care from a system that, at best, is overcrowded and indifferent and, at worst, abusive and life-threatening. It involves being subject to rules such as getting down on the floor immediately when an alarm goes off, and there are no exceptions for those with arthritis or other mobility issues. If they don’t comply quickly enough, they are issued tickets, putting them at risk for a parole denial and extending their stay in prison. Most importantly, compassionate release is not a policy of simply throwing people onto the street to avoid paying the exorbitant costs of medical care. Instead, it allows people to spend their last years at home with their families. Women like Helen could have spent the last year of her life with her adult son and other family members instead of dying alone in the prison infirmary. Patricia Wright’s children and grandchildren are still hoping for this possibility. In the meantime, Dorotik continues to reach out to individuals, organizations and legislators in the hopes that someone will take up her proposal and allow some of these elderly women to come home.